As Christians we believe in the death, burial and resurrection of Jesus. This is, in fact, one of the fundamentals of faith. Without this victory over death we could not enter into the kingdom (John 11:25; 1 Thes 4:14; Romans 6:4; Romans 8:11; 1 Cor 15:12-32). The fact that Jesus rose from the dead is corroborated by many witnesses in the Bible. 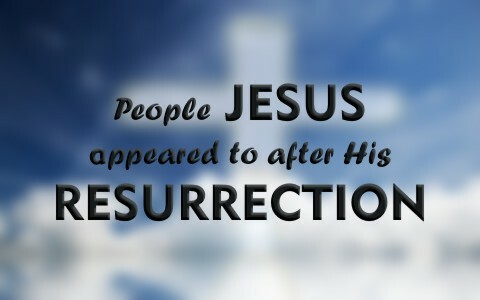 Take a look at what I found in the Bible regarding who Jesus appeared to after His resurrection. This is the time that history records as the forty days between when He rose from the dead and then ascended to Heaven. Matthew 28:1–4 In the end of the sabbath, as it began to dawn toward the first day of the week, came Mary Magdalene and the other Mary to see the sepulchre. And, behold, there was a great earthquake: for the angel of the Lord descended from heaven, and came and rolled back the stone from the door, and sat upon it. His countenance was like lightning, and his raiment white as snow: And for fear of him the keepers did shake, and became as dead men. Luke 24:8–10 And they remembered his words, And returned from the sepulchre, and told all these things unto the eleven, and to all the rest. It was Mary Magdalene, and Joanna, and Mary the mother of James, and other women that were with them, which told these things unto the apostles. Luke 24:33–34 And they rose up the same hour, and returned to Jerusalem, and found the eleven gathered together, and them that were with them, Saying, The Lord is risen indeed, and hath appeared to Simon. Luke 24:13–16 And, behold, two of them went that same day to a village called Emmaus, which was from Jerusalem about threescore furlongs. And they talked together of all these things which had happened. And it came to pass, that, while they communed together and reasoned, Jesus himself drew near, and went with them. But their eyes were holden that they should not know him. John 20:19–24 Then the same day at evening, being the first day of the week, when the doors were shut where the disciples were assembled for fear of the Jews, came Jesus and stood in the midst, and saith unto them, Peace be unto you. And when he had so said, he shewed unto them his hands and his side. Then were the disciples glad, when they saw the Lord. Then said Jesus to them again, Peace be unto you: as my Father hath sent me, even so send I you. And when he had said this, he breathed on them, and saith unto them, Receive ye the Holy Ghost: Whose soever sins ye remit, they are remitted unto them; and whose soever sins ye retain, they are retained. But Thomas, one of the twelve, called Didymus, was not with them when Jesus came. John 20:26–28 And after eight days again his disciples were within, and Thomas with them: then came Jesus, the doors being shut, and stood in the midst, and said, Peace be unto you. Then saith he to Thomas, Reach hither thy finger, and behold my hands; and reach hither thy hand, and thrust it into my side: and be not faithless, but believing. And Thomas answered and said unto him, My Lord and my God. Matthew 28:16–17 Then the eleven disciples went away into Galilee, into a mountain where Jesus had appointed them. And when they saw him, they worshipped him: but some doubted. Oh, what it must have been like to see the risen Savior! I am very thankful that God inspired men to write down this history for us. Reading the accounts is very encouraging as we look forward to the day when we see Jesus face-to-face. I really like how the story about Jesus’ Resurrection is told in a plain and simple manner. Previous post: What Will Christians Be Doing In Heaven? Next post: How Does Grace and Obedience Work Together In A Believers Life?